True adventures go beyond incredible destinations or inclusive packages. Collette delivers a sense of possibility across hundreds of destinations across the world. Since 1918, we have been sharing our love of travel. Today our worldwide travel collection features comprehensive land tours, river cruises, rail journeys, small group tours, garden holidays and more. 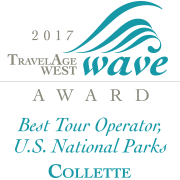 With Collette, wake each morning on tour with a new experience in front of you, and when your head hits the pillow, you will know it has been an amazing day. Best of all - we seamlessly handle the details. All you have to do is enjoy the adventure.